These tips will help you cut energy waste when using your current appliances, and make smart decisions when buying new ones. Avoid using multiple refrigerators or freezers. An extra refrigerator can add up to $150 a year to your PUD bill. Keep your freezer full and its job will be easier. If you don’t have a lot of frozen items, you can use water-filled containers to add mass. Check the seals by closing the door on a $1 bill. If it slides out with no resistance, the seal may need to be replaced. Don’t set the temperature colder than necessary. Keep the refrigerator between 36 degrees and 42 degrees Fahrenheit and the freezer between -5 degrees and 0 degrees Fahrenheit. If you have a manual defrost model, be sure to defrost regularly. Frost build up makes your unit work harder. Only run full loads of dishes. Full loads use the same amount of hot water and energy as partial loads. Select the shortest cycle that properly cleans your dishes. Skip rinsing the dishes; scrape the plates instead. Use the air dry feature on your dishwasher. Clean the filter or filter screen regularly. The average household does about 400 loads of laundry each year. By following a few simple steps, you can shrink your electric bill – but not your clothes. If your clothes washer has a water level selector, use the lowest practical level for each load. Only wash full loads. Partial loads use the same amount of energy. Whenever possible, wash and rinse in cold water. Today’s detergents are formulated to clean in cold water. Don’t over dry clothes. Not only does this waste energy, but it is hard on your clothes. Clean the lint filter after each load to keep the dryer running efficiently. Periodically check the dryer vent to keep it clear of lint. Sort light and heavy clothes and dry two loads in a row. The lighter clothes will dry faster and the residual heat in the dryer will help reduce the energy needed to dry the heavier load. On clear days, take advantage of the sun and dry your clothes outside, on a clothesline. 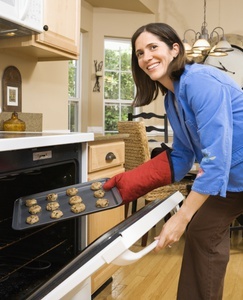 Here are a few ideas to make cooking and baking a bit easier on your energy bill. Give your range or oven the night off. Using the microwave, toaster oven or slow cooker to cut energy use by as much as 50%. Don’t preheat your oven unnecessarily. Most food can be put in the oven when you turn it on. Turn off the oven 15 minutes early, and let the residual heat finish the job. Resist the urge to open the oven door. Each time you open the oven door you lose 25 to 50 degrees of heat. Make sure the seal on your oven door is tight. Even small gaps or tears will allow heat to escape. Don’t cover your oven rack with foil. This blocks the flow of hot air and foods take longer to cook. You can get the most out of your oven by using it to capacity. Try cooking everything at once, or cook an extra meal to be reheated in the microwave the next day. Use an oven thermometer. If the oven thermometer and the oven’s setting don’t match, you may be using more energy than necessary to cook. Make sure your stove top coils work properly. A worn-out element is a power drain. When cooking on your stovetop, be sure to use lids on your pots to keep the heat in. Match the size of the pan to the size of the heating element. Using a small pan on a large burner is a waste. When buying a new appliance, remember it has two price tags: what you pay to take it home and what you will pay each month for the energy it uses. ENERGY STAR appliances will use up to 50% less energy than standard models. The money you save each month on your utility bills can more than make up for the cost of a more expensive but more efficient model. 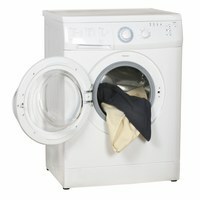 Looking to compare two appliance models? ENERGY STAR’s product finder provides product information to give customers the information they need to make smart purchasing decisions based on energy efficiency.